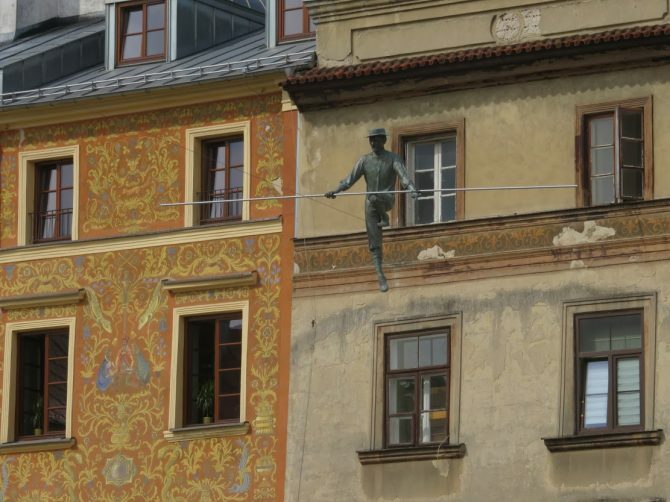 This post is a travelguide with the best things to do in Lublin. Lublin is maybe one of the most underrated cities in Poland. Few people know about it. Myself included, before I travelled to the Eastern part of Poland. What I found is that the old town of Lublin is just as scenic as the more famous cities of Krakow, Gdansk and Poznan and has an equal amount of tourist attractions. I absolutely loved Lublin. Lublin is the capital of the Lublin province and has been a major city for trade and commerce in the region. Situated in between Krakow and Vilnius the city has always attracted merchants and business men and this wealthy history shows off in what is one of the most interesting cities in the eastern part of Poland. The picturesque old town of Lublin is a joy to wander around in with plenty of things to do within its walled gates. It’s like travelling back in time. The oldest part of Lublin are the medieval foundations of a church at the Po Farze square. They are easy to miss and unremarkable. Unlike the beauty that is all around you. Several old gates give way to narrow alleys with pastel coloured buildings. The Krakow gate from 1320 is one of the oldest and now houses the Lublin Provincial museum. The Grodzka gate is also one of the original gates left that once seperated the Jewish quarter from the old town in Lublin. In the 16th century Lublin was a vibrant and multicultural city with a large and active Jewish community that shaped the character of the city for more than 500 years. During the second World war the old town in Lublin was largely left intact and sustained no damage. However, most of its Jewish population perished in the concentration camps of nearby Majdanek and Auschwitz. If you are interested in the Jewish heritage in Lublin I can recommend this Lublin guide . Lublin castle is a must among things to do in Lublin. The royal castle of king Casimir the Great was built in the 14th century and is now one of the oldest preserved royal castles in Poland. In its glory days the royal castle was at the centre of life in this region. Nowadays there are no more kings and queens living in the castle. Wars in the seventeenth century ended the good times of the castle and gave it a more dark purpose. Under Russian rule the castle became a prison and later the Nazi’s used it as a detention center for political prisoners and Jews. Even the communist security services kept using it that way untill they decided to preserve its heritage and renovate the castle. In 1957 the castle reopened as the Lublin Museum. The castle is clearly visible from the old town in Lublin. Even if you are not visiting the museum it is worth walking up the hill. There is a beautiful view and you can enter the castle courtyard for free. There are quite some churches in Lublin, but the cathedral of Saint John Baptist was the most beautiful. The wall paintings are incredible and have plenty of stories to tell. It is easy to find, because it is connected to the trinity tower and close to the old town in Lublin. If you just come from the old part of town this pedestrian shopping street feels new and modern. At night it is a lively affair with busy restaurants and cafés where young Lublin hangs out. The atmosphere is great and it is a good place to go for dinner. But this street also has some interesting historical buildings. The street starts at the Krakow gate. At your right you have the new town hall dominating the square. If you continue on the Krakowskie Przedmiescie you will soon walk by the 15th century church of the holy spirit. The buildings are just as colourful as in the old part of town. Skansen is one of the biggest open air museums in Poland. It is at the outskirts of Lublin in the Czechowka river valley. It aims to show the traditional village life and cultural traditions of people living in the past in the Lublin province. The museum is a great thing to do in Lublin if you want to escape from the city. They also organize several events for christmas, winter, easter and other special occasions. A visit to the Majdanek State museum requires some time afterwards to sit down and reflect on what you have just seen. The museum is situated outside Lublin on what is one of the best preserved Nazi concentration camps in Poland. The quickly advancing Red Army left no time to destroy all the evidence of what happened there. It was both a work camp and extermination camp. Of the estimated 150,000 prisoners in Majdanek 80,000 were killed. Most of them Jews, but also political prisoners and Roma. It is hard to describe a visit to Majdanek in words, but it is a must thing to do in Lublin as this part of history should not be forgotten. How to get there: Bus number 23 or trolley bus 156 leave frequently from the Krakow gate and stop right in front of the entrance of the museum. Lublin is already off the beaten path, but if you want to visit a real hidden gem you should make a day trip to Kazimierz Dolny. A medieval village with a picturesque location just an hour by car from Lublin. How to get there: from Lublin there are several buses a day to Kazimierz Dolny and back. The journey takes about an hour making it a perfect day trip from Lublin. The Lublin Tourism board has developed an excellent app called Visit Lublin about all the things to do in Lublin. They have set out some interesting walking trails for tourists that you can see here. There is also the Lublin card that you can buy online. There are different types that give free access to certain museums and public transport and discounts on a number of restaurants. We were happy with just wandering around and because everything is within walking distance we only used the public transport to visit Majdanek. Therefore we choose not to buy the Lublin card. We were lucky when we were in Lublin, because it happened to be the Festival of European taste. The market square in the old town was full of street food stands where we could taste almost any food from all over Europe. Spanish paella, hungarian goulash, armenian barbecue, italian pizza and of course a lot of local specialities. We decided to try some Polish cuisine and filled our stomach with bigosz. A stew of sauerkraut and pork meat. The next day we tried zapiekanka, the polish version of pizza and had a taste of oscypek. The salty and smoky flavour of the smoked sheeps cheese wasn’t my favourite. This festival is every year at the end of August or the beginning of September. Unfortunately there is only so many space in your stomach and with the festival in town we have seen very little of the restaurant scene in Lublin. The one restaurant where we did go turned out to be a very good choice. Sielsko Anielsko had an extensive menu with traditional Polish dishes that made us regret it was our last night in Lublin and we couldn’t come back. It’s the kind of menu where you want to try everything. Luckily the friendly waitress helped us in our choice and everything we ordered was absolutely delicious. On top of that the restaurant is right in the middle of the market square of the old town in Lublin and prices are very reasonable. We stayed in Lolek hostel . A great place with large and comfy rooms near the old town and Krakow gate. There is a big kitchen that has a good breakfast menu and where you can make tea or coffee any time of the day. Lublin has an excellent public transport system. To see the current timeschedules either check Google Maps or ZTM Lublin. Most things to do in Lublin are within walking distance of each other so we only used the public transport to visit Majdanek. Lublin is easy to reach. From Warsaw it is only 3 hours by train and from Krakow it is around 6 to 7 hours by train. You can check the most recent timetables and connections with other cities in Poland on the site of the Polish Railways. There is also a daily sleepertrain from Warsawa that stops in Lublin and then continues to Kiev in Ukraine. My visit to Lublin was part of a larger trip to Iasi in Romania, Chisinau in Moldova, Tiraspol in Transnistria, Odessa and Kiev in Ukraine and Lublin in Poland. Honestly, I must admit I had never heard of this town before, and I live not too far form Poland! And it seems to be a true gem, so much history and beautiful architecture here!